Should Doctors Use “The Pain Scale” For Injured Individuals? We see it all the time in the medical records. Regardless of whether the injury is from a car accident, workplace incident or something else, many doctors ask the question. Rate your pain on a one to ten scale? Sometimes, the patient is even given a form with numbers and faces to complete. How do you rate your pain on a one to ten scale? I’ve never understood how patients can do it. 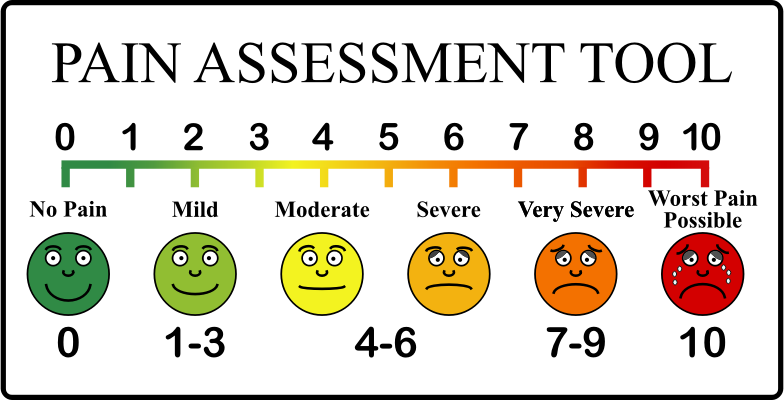 In my practice, I’ve often been surprised by pain scale responses. I’ve seen people hurt so severely they are really in terrible agony. Yet, they will stoicly rate their pain as a 5 out of 10. At the same time, I’ve seen a few people with pretty minor injuries tell the doctor their pain is a 10 out of 10. 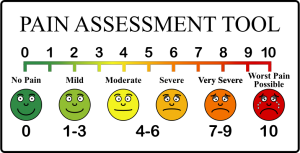 The problem is that pain is subjective and there is zero standard for a person to use a pain scale. I’ve long had problems with the pain scale. Recently, I read an article from a physician who argues “the pain scale” contributes to our nation’s opioid crisis. I’ve never considered that issue. But, I guess a patient statement of significantly-rated pain in the medical records may be used to prescribe pain medications. It’s an article titled, The Pain Scale Shares The Blame For The Opioid Crisis In America. It’s an interesting and thoughtful perspective on a critical issue. My concern with the pain scale has always been practical. That is, it is a completely subjective scale with no standard against which to measure the issue. Instead, I’ve long thought we would be better served by diving deeper into individual pain and how it impacts the patient. For example, when my client suffers a shoulder injury in a car accident, I am interested in the scope of their pain. But, instead of a totally arbitrary and subjective scale, I am more interested in how that pain affects them. Can they sleep? Can they function during the day? How does it affect daily activities? Are they able to return to work? What activities are limited like driving, lifting, moving, reaching? These are important questions. The author of the opioid crisis article makes the same case. A deeper dive into the actual impact of the injury and pain is much more important. That personal impact is the critical information needed by medical professionals trying to help heal the patient. That personal impact is the critical information needed by vocational experts trying to assess the impact of an injury upon work. And, that personal impact is the critical information I need to tell the client’s true story. If you are hurt, you may share my concern. How do I rate my pain on a one to ten scale? It’s an almost impossible task. Instead, I’m concerned with how this pain affects me. Those impacts are my concern. We understand that. If you have a personal injury question, give us a call. We are happy to answer questions. At the Blackwell Law Firm, our attorneys have spent years helping injured clients across Alabama. We dig deep into the medicine of our cases to understand how injuries impact our clients in everyday life.